I love the colors of this dish the bright reds and greens of the vegetables pairing very well with the earthy tone of whole wheat couscous; creating a well balanced work of art that sustains tastefully and visually. 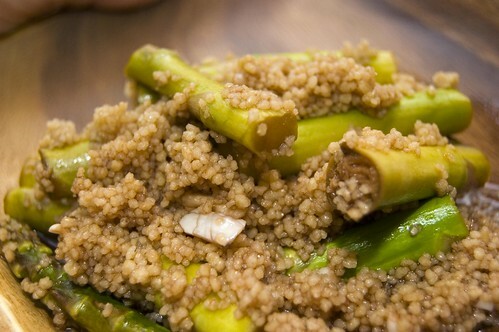 While I wouldn’t call this a heavy dish, couscous is a grain and pushes this to the upper echelon of the “light” scale. 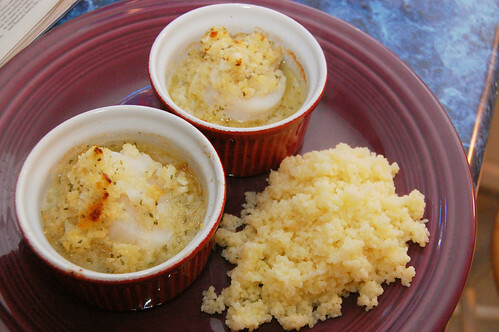 Serve as a main course that won’t weigh down or as a side dish, paired with some protein. I can see some sort of chicken dish as an excellent accompaniment. 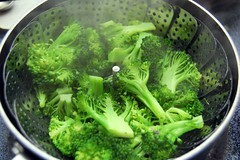 Steam your broccoli until only slightly tender, about five minutes and remove from your steaming water source. Set aside. Bring a bit more than half a cup of water to a boil i a small pot, add couscous, remove from heat and let sit, covered, for at least five minutes. Fluff with a fork. 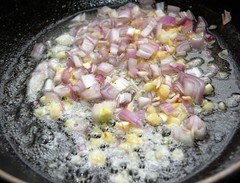 Cook your onions (with the oil) in a large pan at medium heat for one minute. 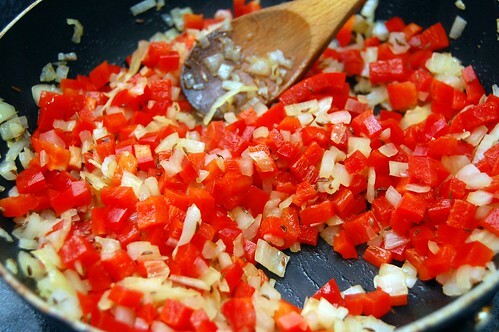 Add the red bell pepper and cook until the onions become partially translucent and the red pepper has become slightly soft; approximately 5 minutes. Stir occasionally. 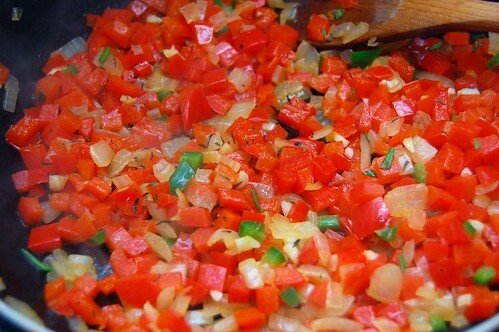 Reduce to medium heat, add your garlic, jalapeño and herbs and cook until the garlic is fragrant; approximately 1 minute. 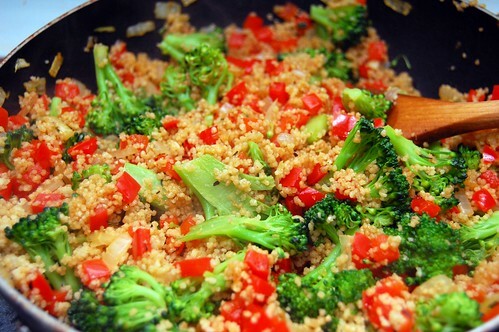 Reduce to medium-low heat and add your broccoli, couscous, tamari and salt. 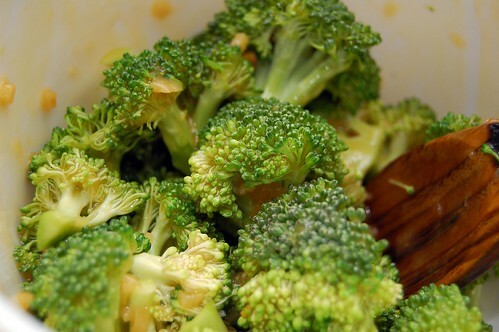 Mix well and cook until the broccoli is tender. Remove from heat, serve and enjoy. 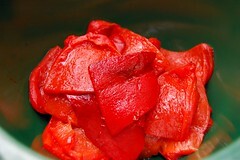 Red bell peppers! I’m totally rockin’ the whatever’s-on-sale cooking mentality right now and, of course, with all the veggies coming in it is going quite well. It’s a bit wild how red bell peppers and green peppers are only different by how ripe they are. Mother nature, you are full of surprises. This recipe’s a little more involved with the roasting, but the process really extracts some great flavor and the richness of the cream works well. I personally think bisques (like many soups) are better the day after. Not that I waited that long, of course. Roast your peppers, peel, and set aside. With the oil, sauté your onion and carrot until translucent; about 5-8 minutes. Add the garlic and cook for another minute. 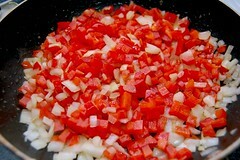 Add the bell pepper, enough stock to cover and spices. 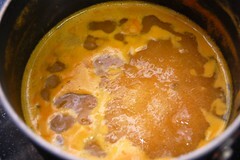 Bring to a boil and simmer, covered, for 20 minutes. 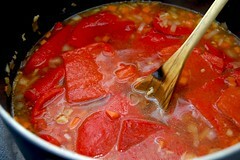 Let cool briefly and blend in 2-3 batches and strain back into the pot. Add the cream, gently reheat and add salt & pepper to taste. Serve and enjoy. I had a hankering for something with a citrus taste to it, which is fitting given the plethora of oranges available lately. At first I tried something similar to what I’ve done with lemon: a little oil, a little tarragon, a couple tablespoons orange juice and some minced ginger. The results were lackluster, with very little of the individual flavors coming out and completely missing my citrus-like goal. Sadness. After mulling it over, thinking of some of the asian-inspired citrus dishes I’ve had (orange chicken), I decided to give it another go. 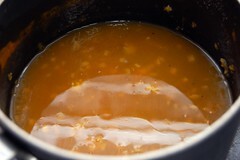 Instead of a splash of orange juice I decided to make an orange reduction sauce. Reductions are great for intensifying flavor, which was really what I wanted, and allowed me to avoid adding too much liquid. I didn’t want it “wet” for fear of lousy roasting. I brought everything from juice to vinegar to a boil in a small pot and simmered until I reduced it by a little more than half; about 20 minutes. I was hoping for the powdered sugar to do a one-two combo, sweetening and thickening, and added additional corn starch after a while when I wasn’t getting the viscosity I wanted. Massive clumping action ensued, reminding me to always prep thickeners in a bit of liquid on the side. Alas. 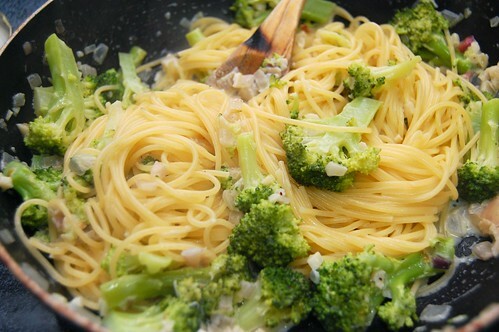 This wasn’t a lot of broccoli, which became quite apparent when I tossed it with my reduced sauce. 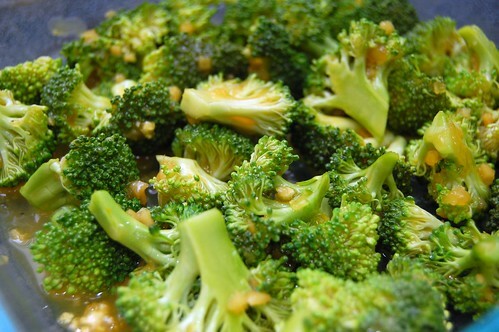 I threw it all in a small 8×8 glass baking pan and roasted for about 15 minutes, until the broccoli was tender. Actually, I could have stopped earlier but there was a lot of liquid. The result? Mostly positive. 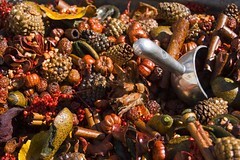 This go ’round the orange flavor was preserved and was a major component in the overall taste. 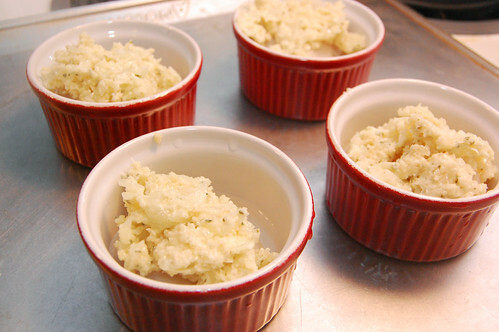 The sweetening of the various ingredients was mostly positive, but perhaps a bit too sweet. though I think it could have been scaled back a bit, maybe with only one tablespoon of honey. I’m not sure what role the ginger and rice vinegar played, whether they were subtle agents in the background or merely ineffectual add ons. 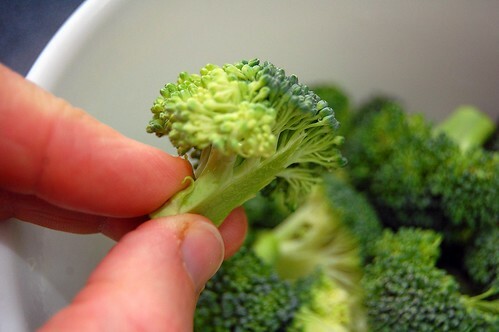 The broccoli was a wee bit chewy and I’m curious if this was a result of the lack of oil or just the wonders of mega mart food quality. I’ve never really sat down and thought hard about exactly what oil does. Something worth exploring. Overall happy with the results and progress made, and I will be sure to revisit and tweak in future meals. What? I’m supposed to go back to posting recipes now?! Thanks for hanging in with me while I posted a weeks worth of Jeopardy updates. It was a close and hard fought game last night, one that I know my husband would love the chance to play again, but he had a fantastic run! Thank you for watching him and for all the support and enthusiasm! Food wise, the last week has consisted of night after night of Jeopardy viewing parties. Chips, pizza, cakes… and all my work on food moderation flew out the door. I’ve been noticing what some of my fellow grad students bring to class to eat or have at cookouts – yogurt/oatmeal/fruit mixture breakfasts, brie/bread/fruit lunches and lentil/brown rice/goat cheese sides for dinner with freshly baked wheat bread. The way they eat blows my mind, and I’m envious. On a weeknight when I’m strapped for time, my fall backs are spaghetti & marinara or a quickly thrown together chicken dish. I just never default to vegetarian dishes; I would have no clue how to make a filling meal out of it.. yet their dishes always look hearty, healthy, natural and delicious. I guess I have to reprogram my meat and potatoes brain? So this meal was something I was able to throw together quickly, but I did try to venture somewhat outside the box. 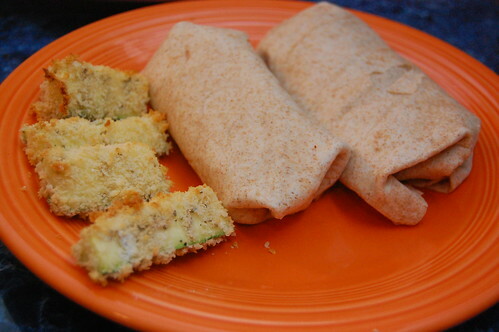 The zucchini fries don’t taste like french fries, but they are good. They’re crunchy and non-greasy, and depending on the spice you give them they can take on a couple different flavors. The original recipe for them is from Weight Watchers, but I kicked it up with some cayenne because I found the original to be a tad bland. I don’t do fake substitutes for fatty things (sorry dad, you can keep your cheeseless cheese), so I found these fries to be a nice compromise. Begin to make zucchini fries when chicken is about halfway done cooking (using suggested method above). Coat a baking sheet with cooking spray. 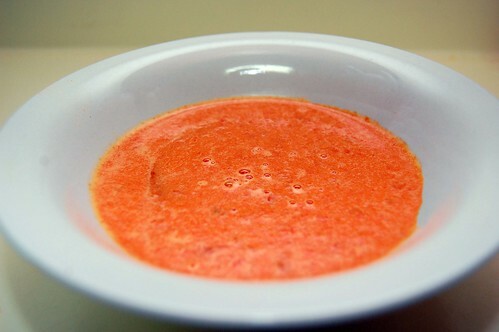 In a small bowl, mix together Italian seasoning, Cayenne, Old Bay, flour and salt. 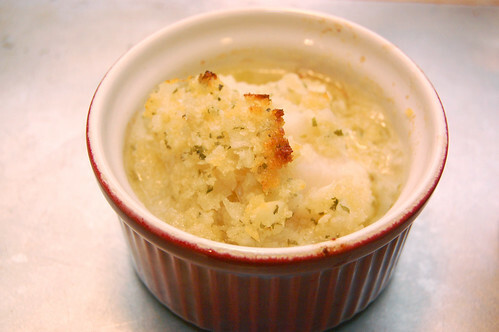 Place panko in another small bowl. 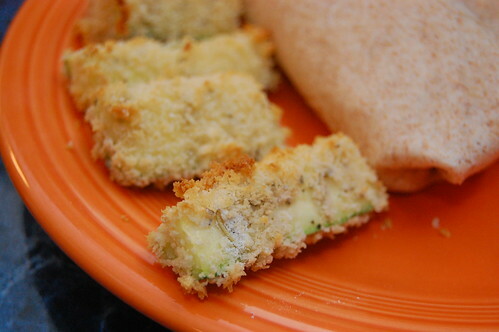 Dredge a zucchini fry in flour mixture and then dip into egg whites followed by bread crumbs. Place coated zucchini on prepared baking sheet and repeat with remaining pieces; liberally coat with cooking spray and add to oven under the chicken (peaking at chicken for doneness). Turn once about halfway through. For crispier fries, cook longer. When chicken is done, cool slight and cut into small pieces with a knife and fork. 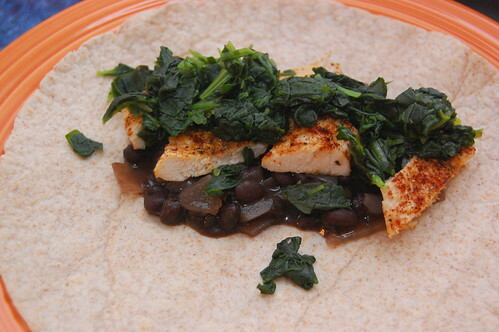 Add black beans, cooked spinach and chicken to wraps and fold. Serve zucchini fries immediately. The weather has been amazing here lately and on top of climbing, grilling and just wearing less (bow chica bow wow), I’ve been thinking a lot about the upcoming bumper crop of vegetables and fruit. It’s going to rock! The roots are still kicking though, and after seeing cauliflower on sale at my local grocery store I decided it would be paired well with some yukon golds. 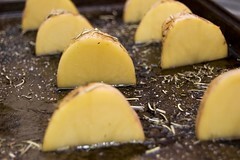 Not a bad recipe, but I’d cut the potatoes smaller than shown in these photos. Cook the potatoes with four tablespoons of oil in a large non-stick pan on medium-high heat (pan fry) for 10 minutes or until golden brown. 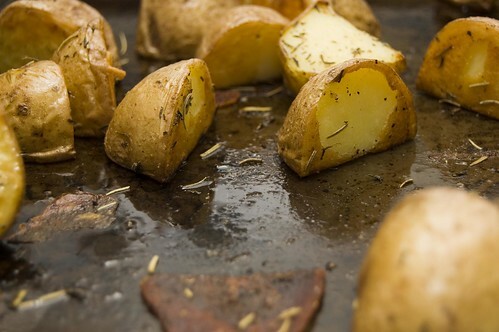 Drain the potatoes on some paper towels and set aside. 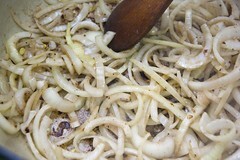 Reduce to medium heat, melt the butter and add the onions, cooking for 5 minutes until soft and lightly browned. Add the pepper, garlic and ginger, cooking for another few minutes until the garlic is fragrant. 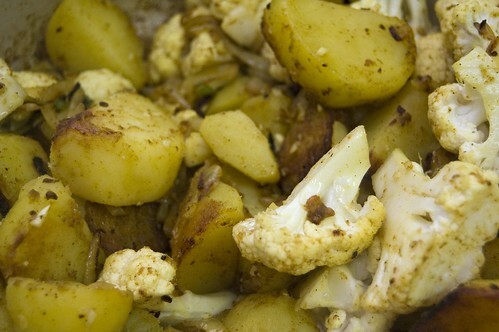 Add the cauliflower, potatoes, curry and simmer covered (you may need to raise the heat briefly) until the the cauliflower is tender and the potatoes are easily pierced; approximately 15-20 minutes. Serve with salt and enjoy. In my quest to appreciate the fungus known as mushrooms, I’ve been perusing some of the cookbooks at the local library. 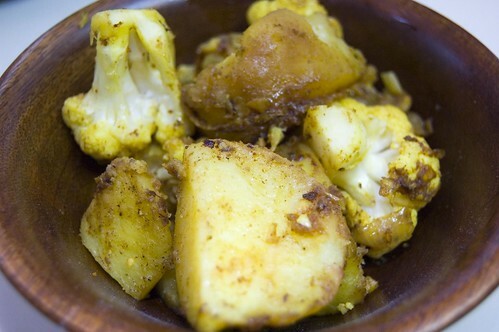 On amazing dish I came across was for roasted Portabello mushrooms from the book Veganomicon. By far the best mushroom dish I’ve had. I decided to try a variant of this with asparagus, as this vegetable is showing up in markets quite heavily as spring begins to roll in. 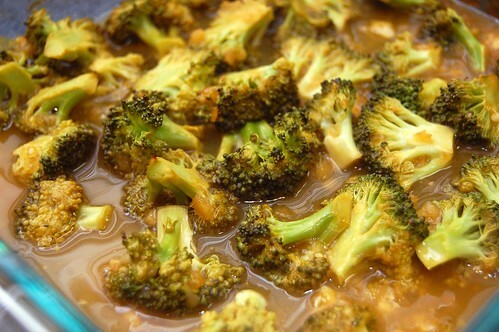 While not as tasty as the original recipe, I like how the reduction works with this vegetable. There is plenty of liquid, which I sopped with couscous, but consider this as optional. 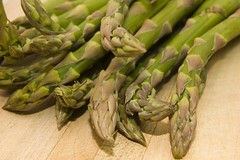 1 pound asparagus; woody ends removed and chopped into 1-2 inch pieces. Preheat the oven to 400. Combine and mix everything but the asparagus. 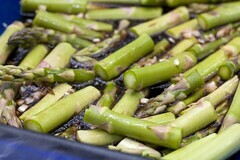 Place the asparagus in a large baking pan and pour in your “sauce”. Roast for 20 minutes, serve and enjoy. The first signs of Spring came out in style this past weekend with some excellent sun, a light breeze and warm temperatures that helped you forgot the horror that snowpacolypse. On Sunday a group of of us went on our first outdoor climb of the new year at Great Falls. Despite rather high water levels we had a blast and got some excellent climbs in. Inspired by the weather, I ventured out to the Falls Church Farmers Market on Saturday, which has actually been open since January. Props to that. 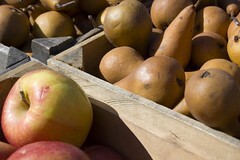 There’s something calming about Farmers Markets; centering. Scores of people walking about just talking, sampling food; no rush, no place they have to be. It’s just a contrast from the usual everyday life in DC where actually forget about how much stress and urgency we’re practically swimming in. With us being on the tale end of winter, I honed in on the root vegetables; beets, leeks, potatoes… and a few apples of course (huuuuge Fuji’s. yum!) The leeks ended up in a nice simple, but delicious potato leek soup and I have visions of a small batch of borscht for the beets. 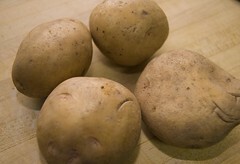 The potatoes, yukon golds to be exact, had their own destiny. 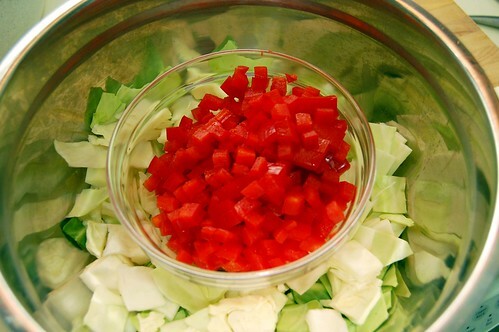 A very smart person once said that the secret to good food is to use fresh ingredients and do very little to them. While it’s easy to to consider the potato as nothing more than bland, there is an essence of flavor somewhere and simplicity is the best way to draw that out. Local fresh is key here. Potatoes start with a rather thin skin when just yanked out of the ground and this thing tends to get thicker as the months roll by (which I can promise you is happening with spuds at your local megamart). When looking for potatoes at your local market, look for paper thin and you won’t be disappointed. Then, toss with a bit of oil, some salt and pepper and then whatever herbs you may like (fresh if you got em but dried if you don’t). Consider this a guideline. Throw out the cookbook (or, put it back on the shelf). Preheat your oven to 400°. 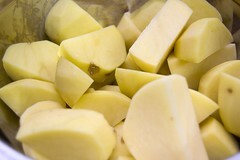 Cut your potatoes into 1.5 piece cubes, most likely just in half unless there notably large; in which case quarter them. 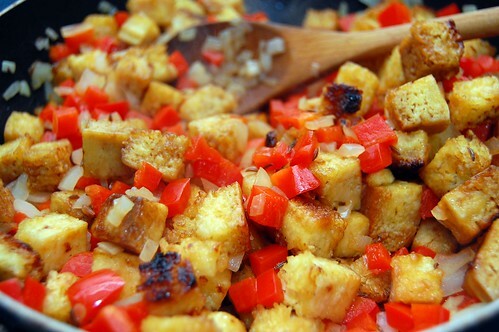 Toss with a tablespoon or two of olive oil. Start with one and add more if necessary for a light coating. 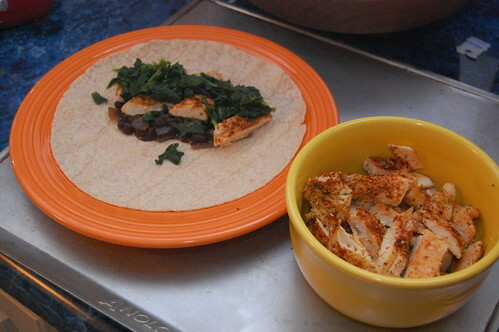 Throw in a tablespoon of fresh herbs or a teaspoon of dried and set on a sheet pan. Sprinkle with a bit of salt and pepper and bake for 30 minutes until the pieces are easily pierced but still firm. Let cool briefly, serve and enjoy.